One area of gaming that has reached perfection recently has been football games. They’re just quite frankly cannot get any better. With two great football games (Fifa and Pro Evolution Soccer) on the actual playing side and one great management simulation (Football Manager), it’s hard to see where football games can improve. Maybe a route is open for an over the top football game with bright graphics, visuals and that excellent mid 1990’s charm. Something like Super Sidekicks 3: The Next Glory. 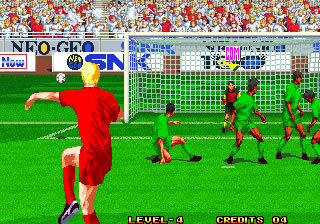 Released in 1995, it was the last game in the Neo-Geo’s “Super Sidekicks” series released in the Arcade, and was a refined football game that followed the ever expanding format of the Super Sidekicks. By the third game, the mechanics were in place, and everything that made this series great came to a crescendo in 1995. Never a serious simulation, the control system was a joystick and 3 buttons (one for a floor pass, one for a looping pass and one for one between the two, however you only used the final one usually), and shooting was just either hitting a ball when you’re in the box (where the word “shoot” appears above your head). There was opportunity for long shots, where you had “chance” above your heads. This switched the mode to a first person mode behind the player. Simply place the cursor where you want to shoot, and shoot. It often didn’t work, but it was a nice touch. When the game switched to chance mode. You *could* score. Often though, you didn't. One thing this game had in spades was stats and teams. Especially for an arcade game. There were 48 teams in the game, split into 6 geographical regions. Goalscorers, injuries and “World Stats” (which related to how teams did on that machine) meant that the game felt truly dynamic, even in the confides of an arcade. 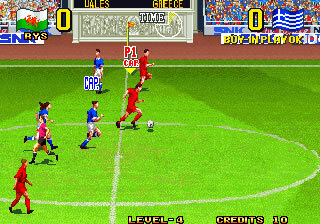 The game features your team’s quest to the World Cup, of which there was 7 games of around 2-3 minutes long each (the game’s timer wasn’t a watch, but a bar that slowly filled up). Lose or draw one game, and you lost. Bit harsh, but nevertheless it led to some frantic action. And action it was, the game was unique in the large sprites, the odd camera angle (slightly lower than most football games of the time) and with plenty of action available nice and easily (bicycle kicks, volleys, headers and all sorts of crunching tackles all done by the touch of one button), add onto that the brightly coloured sprites and thumping main tune/goal tunes and you had a great little arcade game. It wasn’t perfect, goalkeepers were impossible to control and it will never be better than some of the football games out there, however – as far as a fun little football game – Super Sidekicks 3 ticked all the right boxes. Check it out. I have to agree with this review, I had some great times with this game when I was a kid. Sure, SNK could’ve done better with the graphics (like say, putting NUMBERS on the back of the jerseys). Also, the tournament system could’ve made more sense, like in Virtua Striker, which is just a knockout tournament, where it makes more sense to lose a credit if you lose and draws are decided on penalty shootouts (which you don’t need a new credit to play on). But it was hella fun nevertheless. And funny as well; you could escape a sliding tackle by flipping in the air with the ball still at your feet, as well as throw your opponent over the shoulder/kick them in the chest right in front of the referee, and sometimes you wouldn’t even get a card. So damn funny.